Get AfricaFocus Bulletin by e-mail! When National Security Advisor John Bolton presented the administration´s "New Africa Strategy" at the conservative Heritage Foundation on December 13, the Washington Post headlined Bolton´s warning that “´predatory´ China is outpacing the U.S. In Africa" (http://tinyurl.com/ydgrr7ep). And, according to the New York Times, "Bolton Outlines a Strategy for Africa That’s Really About Countering China" (http://tinyurl.com/yc73fx9j). But however prominent the theme of U.S.-China competition in current news, neither this framework nor any other overarching theme is likely to prove a reliable guide as either a description or prescription for actual policy. In fact, the Trump administration´s Africa policy will likely continue to be as chaotic as administration policy more generally, and more of a continuity with the policy of previous administrations than it appears from the rhetoric from senior officials. However extreme the incoherence now, the failure of a single framework to define policy, as both historians and analysts of current events can attest, is not an exception but rather commonplace. Outcomes for specific issues and countries result from a complex interaction of causes, including those unrelated to priorities set from the top. This AfricaFocus Bulletin contains excerpts from and links to relevant recent articles illustrating this point in relation to the US-China rivalry. More broadly, on economic issues, the joint economic policy prescriptions advanced not only by the United States but also by multilateral institutions such as the European Union, World Bank, and International Monetary Fund are at least as important as the bilateral U.S.-China competition. And in confronting African security crises, country-specific and regionspecific factors appear to continue to be more important than the China rivalry in U.S. responses to cases including the Democratic Republic of the Congo, Zimbabwe, Nigeria, Western Sahara, Somalia, and the Sahel. It is far beyond the scope of one Bulletin to delve into U.S. security policy in these highly diverse contexts, in which policies of African and European governments, advocacy by human rights and humanitarian organizations, the United Nations, and disagreements within the U.S. Government all play a role. But one useful general guide is to acknowledge that policy is shaped both by general paradigms as well as particular circumstances. In the security realm, despite Bolton, US-China competition is still far lower in impact on actual policy than the overarching themes of counter-terrorism and international response to instability. Another AfricaFocus Bulletin sent out today, and available on the web at http://www.africafocus.org/docs19/usa1901b.php, features excerpts from Elizabeth Schmidt´s recently published book on Foreign Intervention in Africa after the Cold War, containing both overarching frameworks for analysis and a carefully selected set of case studies. While Bolton stressed the threat from China, both the talking points and congressional testimony from the State Department featured more anodyne and familiar tropes about “prosperity, security, and stability.” Assistant Secretary of State Nagy included only one sentence referring to China: "The Administration will encourage African leaders to choose sustainable foreign investments that help states become selfreliant, unlike those offered by China that impose undue costs." Two recent articles also point to the complexity of U.S.-China relations in Africa. Detailed account of how a U.S. company won over Chinese competitors in a deal for an oil refinery in Uganda. A reminder that both the U.S. and China, despite their commitments to renewable energy, are also investing in the fossil fuel sector in which short-term benefits for Africa will be quickly outweighed by long-term damage to the environment and climate. Detailed account of how the US, China, and Russia as well worked with Nigeria to transfer vulnerable highly enriched uranium (now not needed for civilian research use) away from a research reactor in Kaduna back to China for safekeeping. China, and Russia to a degree, are ahead of the game, but the U.S. has the advantage going forward. In the 19th century, Europe’s great powers were caught up in what historians have dubbed “the scramble for Africa,” as Britain, France, Germany, and Italy competed with one other to establish colonies and control over the so-called Dark Continent — a competition that increased international tensions and ultimately helped to set the stage for the First World War. Today a new scramble is underway, pitting the United States and China and, to a lesser degree, Russia against one other as they try to coax into their respective camps the new Africa that’s emerging in the 21st century. At stake are Africa’s rich natural resources, rapidly growing markets, and political and military influence over the planet’s Southern Hemisphere — and a major portion of the world’s population. This scramble will do much to shape the 21st century, just as the earlier scramble shaped the 19th. It will also become a major epicenter for the ongoing competition between the U.S. and China for economic and strategic leadership. Fortunately, the Trump administration understands the stakes involved. 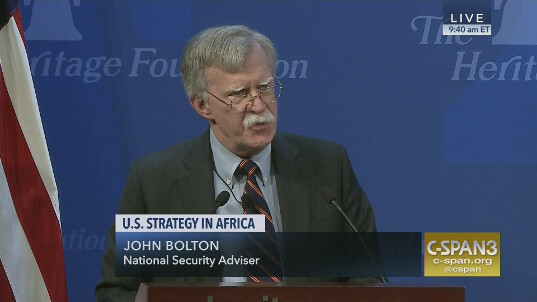 Last week National Security Adviser John Bolton gave a speech unveiling the administration’s new Africa strategy. Unfortunately for the U.S., China has a big lead in this competition, and making up the difference won’t be easy, even though it will have to be a critical part of America’s 21st-century agenda. But America has one clear advantage going forward. Unlike the last scramble for Africa, in the 19th century, when all the participants wound up being imperialist bad actors, this scramble has two very bad actors, Russia and China, and one clearly good guy ready to ride to the rescue — namely, the U.S. While China’s efforts in Africa have been brutal and neo-colonialist in the extreme, we can, as Bolton indicated in his speech, show sub-Saharan Africa’s 49 countries how to preserve their independence and autonomy and become part of the modern economic order in ways that benefit their people and increase their prosperity and security — as well as the prosperity and security of the United States. Underlying all this is a fundamental reality: Africa in the 21st century is going to be the next frontier of globalization. It contains more than 30 percent of world’s hydrocarbon reserves and minerals, including rare earths essential for defense needs, and is experiencing the world’s biggest population explosion. The United Nations estimates that Nigeria by 2050 will be the third-most populous country, after China and India, and that Africa’s population as a whole will surpass China’s by 2100. Of the world’s 21 most “high fertility” nations — i.e., with the highest potential for fast population growth — 19 are in Africa. Nor is Africa the economic basket case it once was. According to the African Development Bank, subSaharan Africa is poised to be the second-fastestgrowing economy in the world, with a growth rate of 3.1 percent in 2018 and a projected growth rate of 3.6 percent in 2019–20. All this adds up to a continent ready and eager to join the world’s economic order. Still, it’s easy to see why Africa slipped off America’s strategic radar screen. Decades of poverty and corruption have made Africa seem like the world’s incurable basket case, an impression that the unfolding AIDS crisis in the 1990s only reinforced. The Obama years were wasted in terms of engagement in Africa. While Obama made highly publicized trips to Africa and paid lip service to the idea of helping sub-Saharan Africa escape from poverty and join the modern world, two predators took advantage of U.S. passivity to plant themselves on the continent. The first was radical Islam and Boko Haram. The other was China. While the U.S. and the rest of the West have largely ignored Africa during the past two decades, China has made it an economic and strategic priority. Beijing sees it as the perfect hunting ground for securing raw materials, for overseas business investment, and above all for expanding China’s geopolitical influence, as part of a grand strategy for replacing the U.S. as the leading global hegemon. By 2015 trade between China and Africa was close to $300 billion. It now tops half a trillion dollars. (By contrast, U.S. trade with Arica is barely $5 billion, and has been declining since 2011.) Right now China has more than 3,000 infrastructure projects underway across the continent and has handed out more than $60 billion in commercial loans. But none of it, especially the loans, comes without strings attached. Hungry for economic opportunity, and hungry for cash, one African country after another has willingly turned itself into a Chinese dependency. Dictatorships including those in Ethiopia and Ghana have accepted Chinese help in erecting their own versions of the Great Firewall, in order to gain control of the Internet inside their borders, while adopting the technologies of China’s high-tech police state. Others fell for China’s offer of loans to support those infrastructure projects and soon found themselves in debt traps that they couldn’t escape — and that China is able to use to wield political influence. Zambia is a perfect example. Today it finds itself in debt to China in the amount of $6–10 billion — nearly a third of its total GPD. Chinese control over the country’s economy has put Zambia in a stranglehold. As one former Zambian prime minister put it, “European colonial exploitation in comparison with Chinese exploitation appears benign,” the latter being “focused on taking out of Africa as much as can be taken out, without any regard for the welfare of the local people.” Several other African countries, including Rwanda and Ghana, could make the same claim. China’s growing influence has its military side as well. China’s decision in 2017 to build a military and naval base in Djibouti on the Horn of Africa has been a geopolitical game-changer, given its proximity to the U.S. base at Camp Lemonnier. The Djibouti base location gives China’s new aircraft carriers a place to rest and refit — and to project Chinese power where no one ten or 20 years ago imagined it possible. Finally, the new U.S. policy will stress engagement through bilateral ties with individual African states instead of reliance on multilateral bodies such as the World Bank and the U.N. The U.N.’s human-rights record in its African peacekeeping missions, for example, has been horrendous and has only played into China’s pose as Africa’s last best hope. All this represents a breath of fresh air in America’s policy toward Africa and gives us an important, benign and active role in the coming scramble for Africa that will dominate much of the 21st century. Will that competition lead to greatpower tensions like those of the 19th century? Not if the U.S., unlike China, which treats African countries as neo-colonial dependents, invites African countries to be partners in a new order for the subSaharan region — and for the United States. In end, how ironic will it be that while President Obama, who proudly touted his African heritage, allowed Russian and Chinese malign influence — as well as that of ISIS and Boko Haram — to grow in Africa. Donald Trump, the man whom the media and liberals and some conservatives paint as a racist, is the one on course to become the liberator of Africa from Chinese neo-colonialism and to set the continent on the path to peace and prosperity at long last. "The United States should return to the Paris climate accord and work with China on environmental and climate-change issues, as the epic struggle against global warming requires active participation from both nations. But I believe the easiest route to bilateral cooperation lies in Africa. Both countries are already heavily involved there in fighting disease, building infrastructure and keeping peace — sometimes cooperatively. Yet each nation has accused the other of economic exploitation or political manipulation. Africans — like billions of other people around the world — do not want to be forced to choose a side. Instead, they welcome the synergy that comes from pooling resources, sharing expertise and designing complementary aid programs. By working together with Africans, the United States and China would also be helping themselves overcome distrust and rebuild this vital relationship." University of the Witwatersrand provides support as a hosting partner of The Conversation Africa. lasting stability, prosperity, independence and security on the African continent are in the national security interest of the United States. But he then went on to ignore Africa’s own efforts to address these broad challenges, including its multilateral initiatives. Instead, Bolton’s announcement was replete with rhetoric reminiscent of the Cold War. The new strategy makes one thing clear: what really matters to Trump is not Africa but containing and countering China. The reaction from an African perspective is likely be bemusement rather than surprise. Trump has shown little interest or empathy towards Africa. And much enmity toward China. His Africa strategy ignores two decades of complex – but generally positive – reactions across sub-Saharan Africa to China becoming the region’s biggest trading partner and a major source of aid and investment. China uses bribes, opaque agreements, and the strategic use of debt to hold states in Africa captive to Beijing’s wishes and demands. But does it need to be this way? I would argue not. Africa offers China and America an opportunity to demonstrate to the world – and to each other – that their competition can be constructive with Africa playing a moderating influence by brokering an agreed trilateral agenda. We need to explore ways to advance cooperation between Africa, China and the US as a confidence building measure in relations between the US and China. This would obviously need to be designed for the primary benefit of African partners. Collaborative projects that involve the US and China, with Africa in the forefront, have been the focus of a Carter Centre project since 2014. The centre’s many successful programs in Africa, especially public health, have generated high-level trilateral policy interest. Since the Trump administration took over, these conversations have excluded his senior advisors. Nevertheless, work has continued. This has included recent developments which suggest headway is being made. In early December the South African Institute of International Affairs hosted the troika that leads this project. The troika was represented by Seyoum Mesfin, Ethiopia’s former and longest-serving foreign minister, an ambassador to China, and regional mediator in Sudan; Zhong Jianhua, formerly China’s Special Representative on African affairs and to the Sudan conflicts; and Donald Booth, a former US ambassador to Liberia, Zambia, Ethiopia and special envoy to Sudan/South Sudan. Three dozen African, Chinese and US scholars as well as policy experts contributed their analyses of previous and possible future areas for trilateral cooperation. They drew on some recent examples. These included efforts to combat piracy off the Horn of Africa and Gulf of Guinea as well as jointly developing a university campus in Liberia. Other projects have involved coordinated mediation between Sudan and South Sudan and mutually reinforcing actions to deal with the Ebola epidemic in West Africa. Several priority areas for future tri-lateral cooperation were identified. One was the recently constructed headquarters for the Centre for Disease Control and Prevention in Addis Ababa. Funded by China, the next priority for trilateral cooperation is to ensure the centre is equipped to provide better early warning and response to threats like Ebola. Another priority area is expanding economic aid, trade and investment. This could be done through trilateral projects funded under China’s “Belt and Road” initiative and the US Build Act. The act was approved in October by a large bi-partisan majority of the US Congress. A related issue is the huge loss of vital tax revenue to African governments due to huge “illicit financial flows”. These are estimated to exceed annual inflows of foreign assistance. The project will seek ways to encourage US and China to support the work of a panel set up by African Union and United Nations Economic Commission for Africa. Two other broad areas for potential trilateral cooperation are sustainable agriculture and energy. 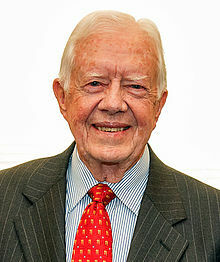 Two initiatives started by the Obama Administration, with the support of Congress, have become popular in Africa. These are the “Feed the Future” and “Power Africa”. Trump has long wanted to cut both. But his negative attitude isn’t shared by the US Congress, and perhaps even key members of his administration. Assistant Secretary of State for Africa, Tibor Nagy, summarised US-Africa policy before the House Foreign Affairs Committee on the same day Trump approved the new Africa strategy. Nagy’s comments reflected a different mindset. He spoke positively about the two Obama initiatives. He also didn’t seem alarmed by China’s growing presence. At a time when many in Africa are debating how to build capable states without the undesirable aspects of either America’s “decadent” democracy or China’s “responsive” authoritarianism, engaging both should yield important insights for advancing collective self-reliance and development. AfricaFocus Bulletin is an independent electronic publication providing reposted commentary and analysis on African issues, with a particular focus on U.S. and international policies. AfricaFocus Bulletin is edited by William Minter.